It is an easy to navigate dating site that keeps the clutter away and gathers only the relevant information. 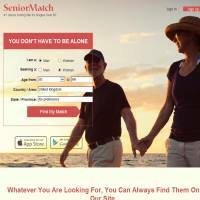 SeniorMatch.com comes with a tagline that you don’t have to be alone and thus focuses on making you meet the mature singles. The site helps you in keeping a tab of your daily activities and also assists you in finding a perfect match as per your listed preferences. The only requirement for joining this website is a valid email address and you are good to go. The process of joining this website is simple and you can do so free of cost. Though under the standard membership plan, which is free, you have a limited access to the website and its amazing features yet you can avail all of those through an upgrade. The website has a list of verified members and thus you can be sure of the suitable matches through their verification certificates. You can also get your own profile verified by paying a small amount. The photographs that can be uploaded need to be of high quality and this ensures that you can have a good look at potentials. You have the freedom to post comments on the profiles of other people. There is also an option of getting involved in a group chat. The news feature helps you stay updated about the new profiles and new features. You can create an entire gallery of yours by posting up to 27 photos in your profile. Gold members can avail the help service provided by the website. The account that you create can be tailored as per your preferences and that too through your own account manager. The live chat support can counsel you and help you to overcome the doubts that may exist. Another peculiar feature is the dating game that can be played to meet the singles in real. The website supports profiles from different backgrounds inclusive of caste, creed, religion, culture and several other physical attributes as well. This is one of the best websites that help senior singles find a match for them. With the flexible pricing and also the ability to pay via different modes adds to the convenience of using this website. The account can be tailored as per your liking and you can decide on the profiles that you want to interact with. Overall this website has developed an easier way for those over 50 who are looking for a companion.